Father Donald A. Quinn, who had ministered at Our Lady of the Greenwood Parish in Greenwood since 2007, died on Nov. 13 at Indiana University Hospital in Indianapolis. He was 55. The Mass of Christian Burial will be celebrated at 10 a.m. on Nov. 18 at Our Lady of the Greenwood Church in Greenwood. Burial will follow on Nov. 19 at the Priests’ Circle at Calvary Cemetery in Indianapolis. Bishop Christopher J. Coyne, apostolic administrator, is the principal celebrant. The homilist is Msgr. Mark Svarczkopf, pastor of Our Lady of the Greenwood Parish. Father Quinn had been hospitalized for a month with complications from liver disease. He also had suffered from heart disease for 25 years, which required heart bypass surgery several years ago. Msgr. Svarczkopf said Father Quinn provided sacramental assistance and helped with hospital ministry at the large Indianapolis South Deanery parish. “He always used to say that a priest, more than anything else, needed to be kind, and he was a kind man,” Msgr. Svarczkopf said. “His assignment here was really to be a hospital visitor more than an associate pastor. We take care of [parishioners at] six hospitals and numerous nursing homes, and he said that [pastoral ministry] really gave him joy. … Lots of people at our parish are very grateful and appreciative of the work that he did on the campus. Father Daniel Donohoo, a longtime friend, said Father Quinn enjoyed serving God and his people as a priest. Father Quinn also enjoyed helping with the Catholic campus ministry to college students, Father Donohoo said. “He really loved people across the spectrum of life from the young to the aged. Donald Anthony Quinn was born on March 12, 1956, in Seymour to Leo A. and Wilma (Ling) Quinn, and grew up in St. Ambrose Parish. He attended St. Ambrose School, the Latin School in Indianapolis, the former Saint Meinrad College in St. Meinrad, and Mount St. Mary’s Seminary at The Athenaeum of Ohio in Cincinnati. He was ordained to the priesthood on May 21, 1983, by the late Archbishop Edward T. O’Meara at SS. Peter and Paul Cathedral in Indianapolis. Father Quinn celebrated his Mass of Thanksgiving on May 22, 1983, at St. Ambrose Church. His first assignment on July 6, 1983, was as associate pastor of American Martyrs Parish in Scottsburg, St. Patrick Parish in Salem, St. Mary Parish in Mitchell and St. Francis Xavier Parish in Henryville. On July 5, 1984, he was appointed associate pastor of the former St. Catherine of Siena Parish in Indianapolis and the former St. James the Greater Parish in Indianapolis. Father Quinn was named associate pastor of St. Patrick Parish in Indianapolis and Our Lady of the Most Holy Rosary Parish in Indianapolis on July 8, 1987. He also served as the Catholic chaplain of the Newman Apostolate at the University of Indianapolis while continuing as associate pastor of the former St. Catherine and St. James parishes in Indianapolis. 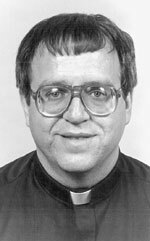 On July 6, 1988, he was named to his first pastorate at St. Patrick and Holy Rosary parishes in Indianapolis while continuing as the Catholic chaplain of the Newman Apostolate at the University of Indianapolis. On July 5, 1989, Father Quinn was assigned as chaplain at Bishop Chatard High School in Indianapolis and associate pastor of St. Lawrence Parish in Indianapolis while continuing as the Catholic chaplain of the Newman Apostolate at the University of Indianapolis. He was appointed associate pastor of St. Simon the Apostle Parish in Indianapolis on July 3, 1991, and continued as the Catholic chaplain of the Newman Apostolate at the University of Indianapolis. On July 7, 1993, Father Quinn was assigned to pastoral care of the Newman Centers at Indiana University-Purdue University Indianapolis and Butler University in Indianapolis while continuing his assignment at the Newman Center at the University of Indianapolis. He was appointed pastor of St. Joseph Parish in Shelbyville on July 2, 2003, and continued his Newman Center ministry as the Catholic chaplain at the University of Indianapolis. On July 3, 2007, he began his last assignment in sacramental assistance and hospital ministry at Our Lady of the Greenwood Parish. Surviving are his mother, Wilma Quinn Abney of North Vernon; three brothers, Dale Quinn of Myrtle Beach, S.C., David Quinn of North Vernon and Jerry Quinn of Richmond; three sisters, Jane Bradley of Findlay, Ohio, Linda Allen of Ames, Iowa, and M. Sue Camp of Phoenix; several nieces and nephews; and several great-nieces and nephews.